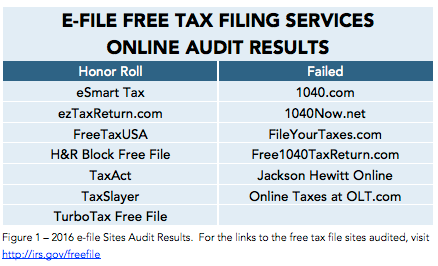 If you’re planning on using an online site to file your taxes this year, be wary. A new audit from the Internet security nonprofit Online Trust Alliance found that nearly half of the 13 tax software websites approved by the Internal Revenue Service are failing to provide adequate security and privacy for consumers. The OTA evaluated the sites using both its own criteria and security and privacy mandated standards that the IRS maintains. “Given that the tax data is extremely sensitive with a high risk for victimization, the failure rate of over one-third should concern customers and the IRS,” OTA Executive Director and President Craig Spiezle said in a statement. “Consumer use and IRS approval of such services should be carefully reconsidered. The firms in question are part of the IRS’s Free File Alliance, which allows anyone who made less than $62,000 in 2015 file taxes for free. Seventy percent of American taxpayers are eligible to participate in the program, though the findings are relevant for all customers of the firms examined, according to the OTA. The sites were graded on the basis of three main categories: consumer protection, site security and privacy. The ones that made the honor roll scored at least an 80 percent in each section, while the other six sites received a failing grade in one or more of the categories. Although the report didn’t specify how each firm performed in each of the categories, it did disclose that three of the failing sites lacked adequate security against vulnerabilities that cybercriminals have previously exploited. Five failed for not taking steps to protect consumers from malicious and fraudulent email. The audit comes as tax scams are on the rise, with the IRS reporting that tax-related phishing and malware incidents have soared this year by around 400 percent. Tax-related fraud cases skyrocketed 154 percent from 2014 to 2015 and show no signs of tapering off.